The request for Fed assistance to boost growth came just after a Labor Department report showed another healthy sign for the durability of an expansion that may become the longest on record by midyear. The jobless rate held near a 49-year low and employers added more workers than economists forecast in March. The report showed little sign of wage inflation. Trump is breaking with longstanding Republican criticism of the Fed’s large balance sheet, and embracing a loose monetary policy that in effect helps finance the nation’s debt load. He repeatedly criticized the Fed under President Barack Obama for holding down interest rates and the use of quantitative easing, which at the time was an effort to lower long-term borrowing costs by buying Treasury bonds and mortgage securities. Stocks gained after Trump’s remarks. The S&P 500 Index just posted its biggest quarterly advance in almost a decade. A segment of the Treasuries yield curve, the difference between 3-month and 10-year rates, narrowed Friday, though traders say that move began after the March jobs data was released. The gap was at around 7.5 basis points, from 8.7 basis points Thursday. The spread inverted last month for the first time since 2007. “We don’t even know what to make of Trump’s comment,” said Ian Lyngen, head of U.S. rates strategy at BMO Capital Markets in New York. Trump has regularly called for rate cuts, but his advice on the balance sheet went further into a debate that’s mostly been among economists and investment professionals. In the aftermath of the financial crisis a decade ago, the Fed bought government bonds and mortgage-backed securities in a strategy called quantitative easing aimed at lowering longer-term market rates after cutting its main policy rate close to zero. That swelled the Fed balance sheet to a peak of $4.52 trillion in early 2015. 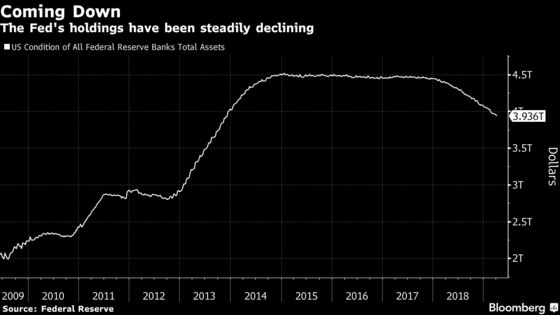 As the economy strengthened in recent years, the central bank has allowed the securities to mature without reinvesting proceeds, which some call “quantitative tightening.” The balance sheet tally recently was $3.94 trillion. Central bankers in March held the benchmark lending rate in a range of 2.25 percent to 2.5 percent and said they would start slowing balance-sheet shrinkage in May and halt the draw-down altogether at the end of the September. Their forecasts showed they plan to hold their policy rate unchanged this year. 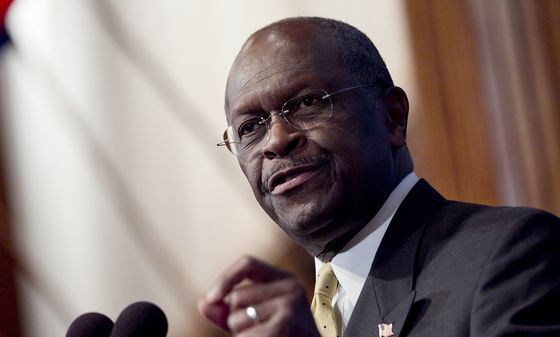 In another effort to influence Fed policy, Trump plans to nominate two political loyalists for the Fed’s board of governors: former Godfather’s Pizza Inc. CEO Herman Cain and Stephen Moore, a fellow at the conservative Heritage Foundation. Their qualifications for the board have been questioned by economists and many lawmakers, and neither has been formally nominated. Fed rate increases last year drew criticism from the president, who even discussed firing Chairman Jerome Powell.